A histogram shows the distribution of the data to assess the central tendency, variability, and shape. A histogram for a quantitative variable divides the range of the values into discrete classes, and then counts the number of observations falling into each class interval. 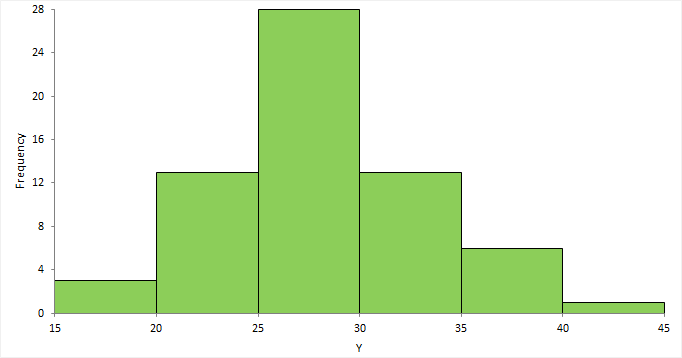 The area of each bar in the histogram is proportional to the frequency in the class. When the class widths are equal, the height of the bar is also proportional to the frequency in the class. Choosing the number of classes to use can be difficult as there is no "best," and different class widths can reveal or hide features of the data. Scott's and Freedman-Diaconis' rules provide a default starting point, though sometimes particular class intervals make sense for a particular problem. The histogram reveals if the distribution of the data is normal, skewed (shifted to the left or right), bimodal (has more than one peak) and so on. Skewed data can sometimes be transformed to normal using a transformation. Bi-modality often indicates that there is more than one underlying population in the data. Individual bars distanced from the bulk of the data can indicate the presence of an outlier.